The number of daylight hours. The relative proportions of full sun versus cloudy days. The orientation and tilt of your installation. Whether there are shadows cast over your cells (due to trees, buildings, etc.). The actual dirt loading at your location. The cost of the water the SolarClear® system will use. The configuration of the panels: how many rows, the number of panels per row, whether orientation is portrait or landscape, etc. Some of these factors are known for some locations, and some can be estimated. 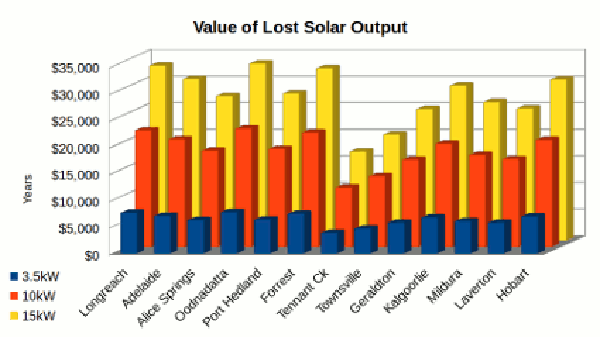 Using these assumptions, the payback period and value of lost solar output for 13 "dry" locations in Australia is shown below. 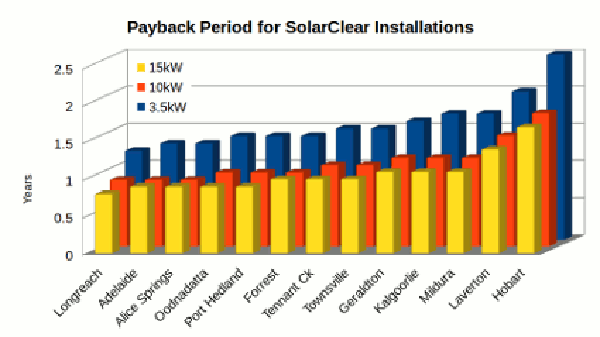 For a 2.5kW (10 panel) system installed in Canberra, we estimate that the payback, over 10 years, would follow the trajectory shown at left. Annual cleaning over the course of a year improves average output by only 3.5%, but costs $150 per clean; it ends up with a poorer payback than unwashed. To see the differences between the diferent SolarClear® models, click here.